An advantage of using textured vector brushes on vector layers is that you can adjust their opacity afterward. Using the Adjust Line Texture Opacity dialog, you can adjust the opacity levels between the most opaque and the most transparent pixels in your textures. If you are in Camera view, select the Current Drawing on Top option—see Displaying the Current Drawing on Top. In the Timeline or Xsheet view, select the drawing that contains the opacity you want to adjust. In the Camera or Drawing view menu, select Drawing > Adjust Line Texture Opacity. Drag the upper slider towards the right to increase the transparency of the more transparent pixels. Drag the lower slider towards the left to increase the opacity of the more opaque pixels. 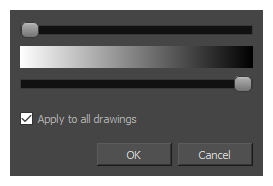 If you want to apply the changes to all drawings exposed on the layer, enable the Apply to All Drawings option.